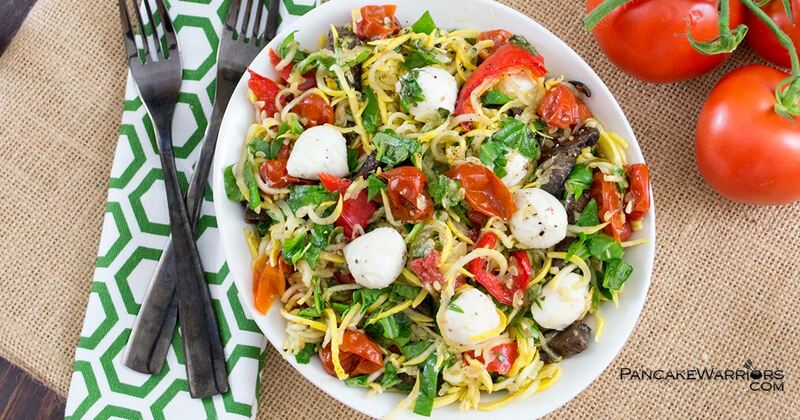 Incredibly easy pasta salad made with summer squash noodles and filled with the favors of margherita pizza - basil, tomato, and fresh mozzarella cheese. This pasta salad is ready in minutes, especially compared to traditional pasta salad! Naturally gluten free,low carb and super filling without any of the guilt! Using a spiaralizer, made zoodles out of the summer squash or zucchini. Add the chopped tomatoes, fresh spinach and mozzarella cheese to the squash noodles. If adding portobello mushrooms, marinade in balsamic dressing and grill 10 minutes on a griddle or outside. on the grill. In a small bowl, combine the basil, white balsamic, garlic powder,olive oil, salt and pepper. Add a lid and shake vigorously. Pour the vinaigrette over the pasta noodles and toss.